Many of you, I’m guessing, suffer from the same malady afflicting me: You are less and less likely to smoke a cigar as it gets older and older. I’ve recognized my affliction for quite some time, but efforts to combat it never worked. It was just too easy to convince myself that, for whatever reason, the time simply wasn’t right to justify burning a special cigar. Recently, though, I made a breakthrough. I decided a couple of months beforehand that my 65th birthday would be the perfect occasion to light up the oldest cigar in my humidor. 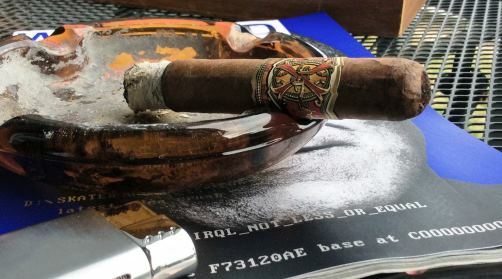 That cigar is—or, rather, was—a nearly ten-year-old OpusX bought at a now-shuttered Clearwater, Florida, shop not long after we moved down here. From the below photo, you can see that the cellophane had yellowed; what you can’t see is the extraordinary plume covering the wrapper. Frankly, I wasn’t sure what to expect. I’ve smoked a few Opus cigars, but none with that much age. I needn’t have worried. It was truly an extraordinary experience. Even at almost a decade, it still kicked off with some strength. That dissipated early on as the nutty, warm, and creamy flavors ramped up. It was as complex and smooth as any cigar I can recall. The white ash hung on tightly as the stick burned ever so slowly, producing thick, rich smoke. Well, I can’t change what I did, or didn’t, do ten years ago. But I can change my behavior going forward and make sure I enjoy the cigars I have in my humidor. To that end, I recently opened a box of 2011 My Father Limited Edition Toros to share. The cigars were tasty and extraordinarily smooth. Frankly, I can’t imagine them improving with further age, so I plan to smoke the remaining stash in the coming months. I’ve also identified my next event and event cigar: a Cuban Cohiba Behike I’ll ignite to celebrate the occasion when a friend and former colleague signs her book contract. Several years ago, my colleague wrote about this very issue, warning readers against “waiting for a perfect cigar moment that may never come.” He was exactly right, and I’m trying to heed his advice. After all, there’s no shortage of things to celebrate. And no better way to celebrate than with a great cigar. I couldnt agree more an inspiring article im going to get one of my well aged cigars and enjoy it in the celebration of another day. Great review thankyou. Maybe we could declare my birthday (Feb. 2) an annual event: International Smoke Your Best Cigar Day!